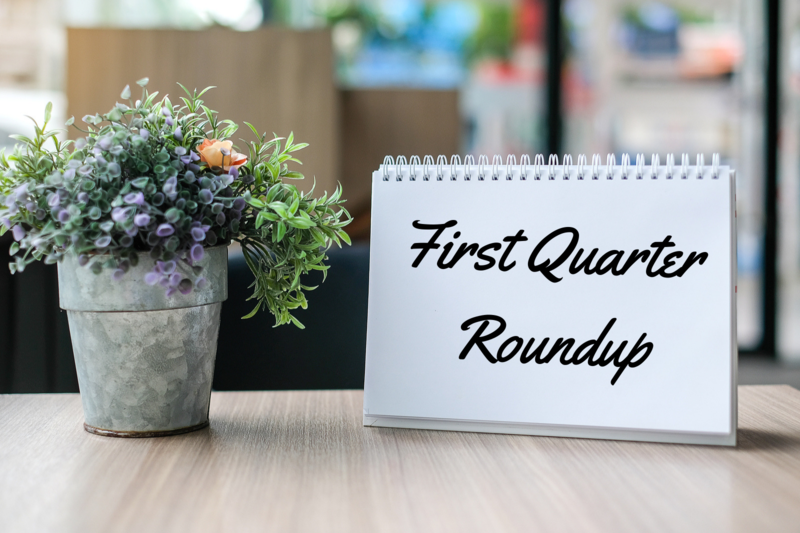 Spring has finally sprung, and the first quarter of 2019 has come and gone. There was a lot of speculation that the labor market was going to slow down this year. However, the job market is still roaring, and we’ve had 102 consecutive months of job growth. In fact, job gains have averaged 180,000 over the past three months. Average hourly wages also were much better than expected. Over the last 12 months, the average hourly earnings rose by 3.4 percent, a rate that we have not seen since April 2009. This drastic growth in wages illustrates that employers are still struggling to find qualified workers and that the market is getting even tighter. If you’re still struggling to attract candidates in this tough market, here’s a few things you can do to improve your chances of finding top talent. We cannot stress this enough. Regardless of where you’re located or what industry your organization operates in, you must streamline your hiring process. Identify and eliminate any unnecessary steps in your hiring process. With more job openings than unemployed people in the US, candidates have plenty of options to choose from. The average hiring process in the US takes about 23.8 days. 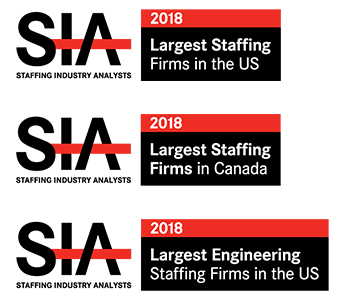 Take some time to examine your hiring process and see how the average length of your hiring process stacks up with the national average. If you’re dragging your feet or taking too long to contact, interview, or even onboard candidates, you may run the risk of being ghosted. Many candidates will choose whichever offer comes in first, which may even be your competition. 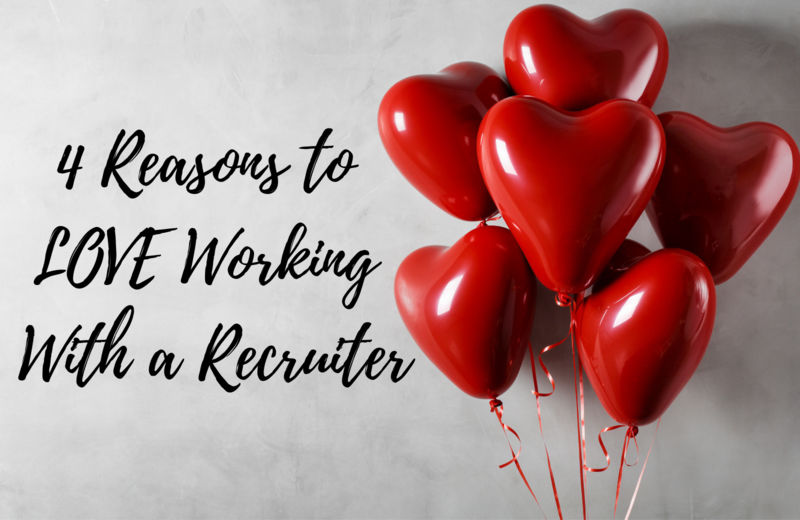 Even if they have accepted your job offer, if you’re waiting weeks and weeks for their first day, you run the risk of losing them to another company who will start them immediately. To mitigate this, make your decisions quickly and reduce snags in your process. Company culture is becoming more important for candidates. Employers need to demonstrate a great company culture to attract and retain great candidates. This is important to note because Millennials will soon be the largest demographic in the workforce. By 2025, Millennials will make up nearly 75 percent of the workforce. With that being said, Millennials care more about company culture than any other demographic. In fact, on average, Millennials would be willing to take a $7,600 annual pay cut to work at a job with a more desirable culture. This generation wants better work-life balance and employers who are more involved in the community. To ensure you retain your younger employees, make sure you take a good look at your company’s culture; see if there are places where you can make changes to attract this demographic. If you are struggling to fill your critical positions or retain employees, it may be time to seek out some help. At JSG, we will take the weight off of your shoulders. Our comprehensive screening process thoroughly evaluates the candidate’s technical ability, interpersonal skills, and reliability to ensure each candidate we present to you is a perfect fit. If you want some help navigating this competitive labor market, reach out to one of our professional recruiters today! 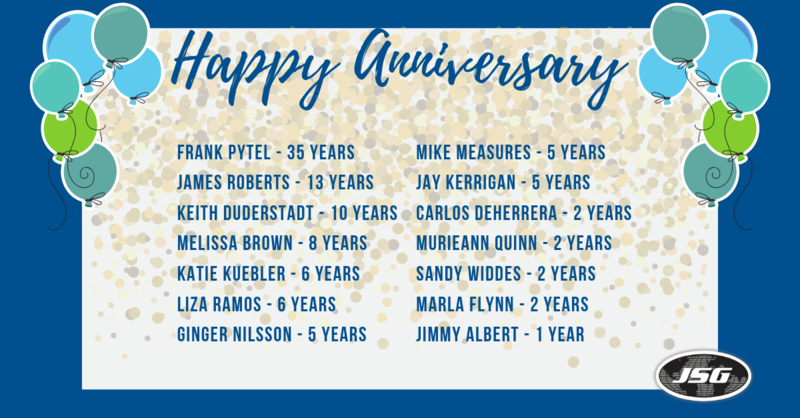 Congratulations to all of our employees with anniversaries in the month of April. We appreciate your dedication to JSG and all of your hard work. 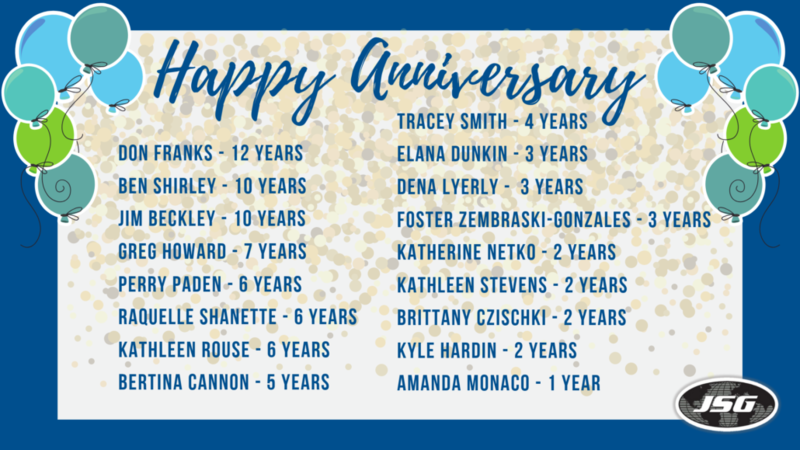 Please join us in celebrating our tenured staff! JSG gained some new faces last month. 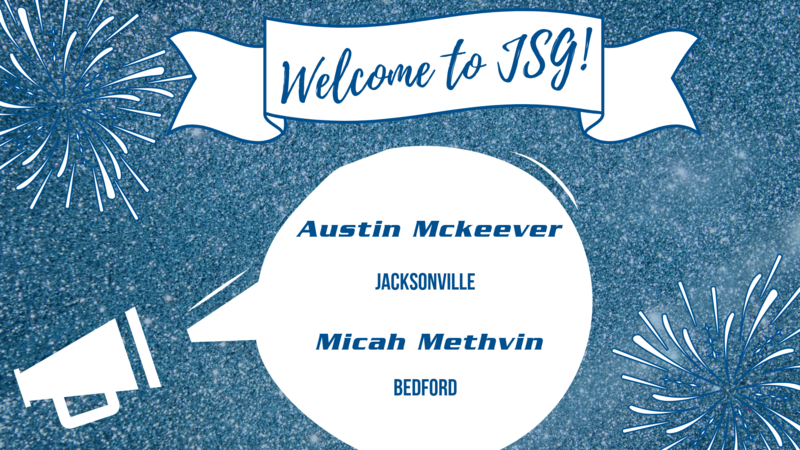 Please join us in welcoming our newest staff members to the JSG team! Michael Polite, Ryan Beckwith, Melissa Vidal-Cruz, and Paul Duke Jr. 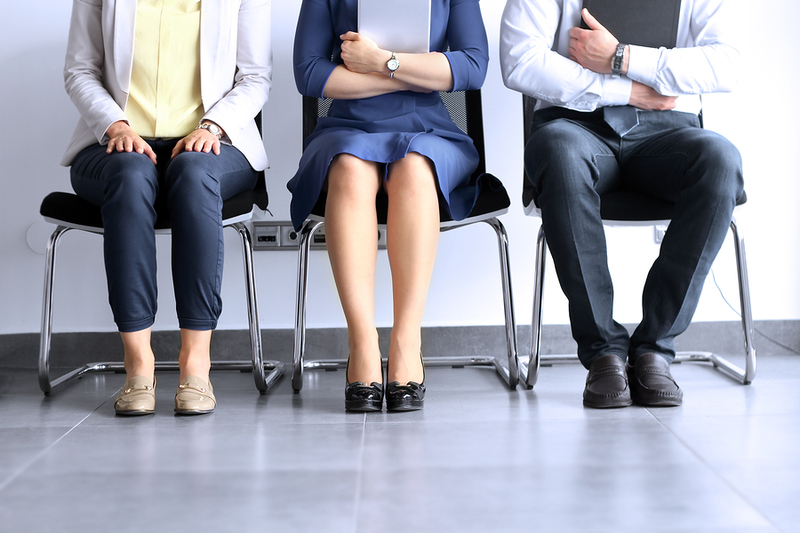 While trying to find the best candidate for your client in a short amount of time, it can be easy to cross that thin line when it comes to interview questions. However, it’s important to stay away from certain topics. You should not ask a candidate about their race, gender, age, religion, sexual orientation, disability or other sensitive topics. Are you planning on starting a family soon? Your name is very exotic; where are you from? What kind of childcare arrangements do you have for your children? Did you take any sick days or extended medical leave last year? We are hiring because our business is about to become very busy. Do you have any plans that might interfere with your ability to work full time over the next year? What year did you graduate college? Will you be able to meet the attendance requirements for this job? Can you perform the job, with or without reasonable accommodation? Other topics to avoid include asking about salary history and criminal convictions; some states have a law banning employers from asking these questions. 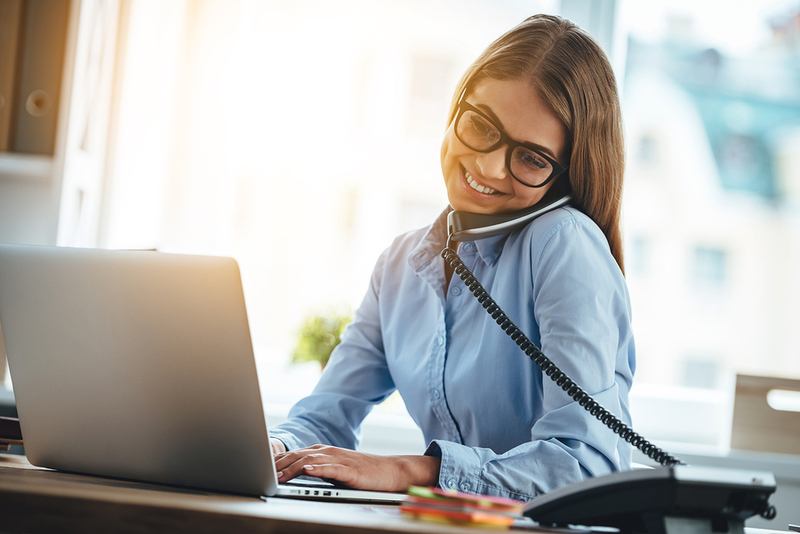 States that prohibit asking about salary history include California, Connecticut, Delaware, Hawaii, Massachusetts, New York (NYC, Albany County, Suffolk County, Westchester County), Oregon, Puerto Rico, and Vermont. These laws are an attempt to end pay discrimination and some even prohibit employers from using this information, even if it’s offered up by the candidate. “Ban the Box” legislation prohibits employers from asking about criminal convictions on a job application and during interviews. The idea is to give individuals with a criminal history a fair chance when looking for employment. States that participate in Ban the Box for private employers include California, Connecticut, Hawaii, Illinois, Massachusetts, Minnesota, New Jersey, Oregon, Rhode Island, South Carolina, Vermont, and Washington. At the end of the day, remember to stay focused on the job that you are interviewing for and if the candidate will meet the criteria. Plan out your interview questions before you jump on a call to make sure that you’re staying within the proper boundaries. Ensure your questions are the same for all candidates and that they relate only to the knowledge, skills, and abilities required for the role. Sometimes physical ability questions may be necessary as they pertain to the role. Check state laws before asking about salary and criminal convictions. As always, if you’re unsure about a question please reach out to the HR team for assistance. Our dedicated IT department has a few announcements they would like to make. Here’s what’s who need to know. Johnson Service Group is currently in the process of transitioning to DocuSign. 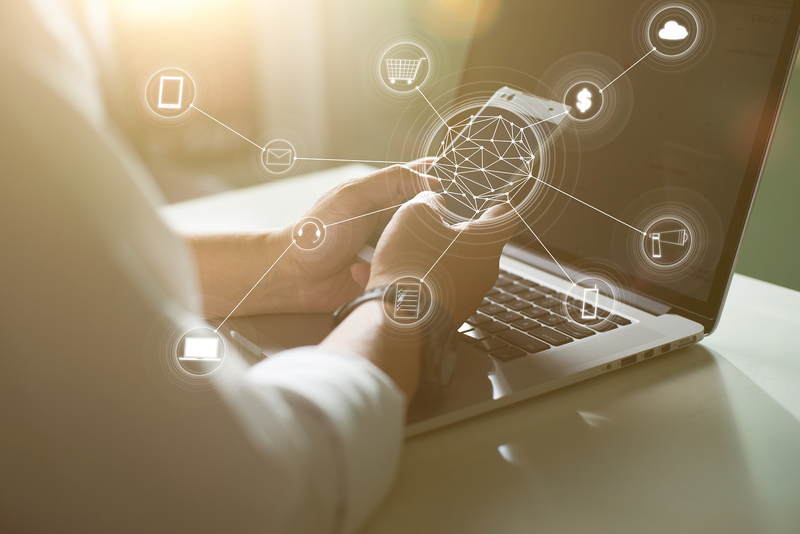 DocuSign provides electronic signature technology and digital transaction management services for facilitating electronic exchanges of signed documents. For more questions, please contact the IT Service Desk. The IT department is currently working on upgrading our firewalls. The new enhanced security will allow us greater protection of network traffic, and the ability to prevent suspicious attacks. The tool also alerts us of any suspicious activities from your individual computer. The IT department would like to send out a friendly reminder of our new Indeed job posting procedures. Our organic feed (free feed) to Indeed has been terminated by Indeed. We have since signed up with Indeed for their job sponsorship program. This program prioritizes our jobs to be listed in Indeed’s search results. In order to get your jobs to publish to Indeed, you need to enter the department tag at the bottom of your job description before clicking the “publish” button in Bullhorn. Here’s how to tag your jobs for Indeed. JSG employees who have access to the “Publish” button in Bullhorn. A tag is a unique identifier within your job description (eg: #D100 or #D200 or #D999). You should enter #DNNN at the end of your job description to publish your job on Indeed. Your tag and cost per click are attached to this tag and each tag is unique to your department. By tagging the job with your correct department tag, the job will automatically be published to Indeed when you press “Publish” in Bullhorn. The unique identifier is #DNNN (NNN is the Dept number with no space). A unique identifier must be a set of characters not found anywhere else on our job record. Insert the unique identifier text into your job description to “tag” your job to publish it on Indeed. Remove the unique identifier when you no longer want to publish that job on Indeed. 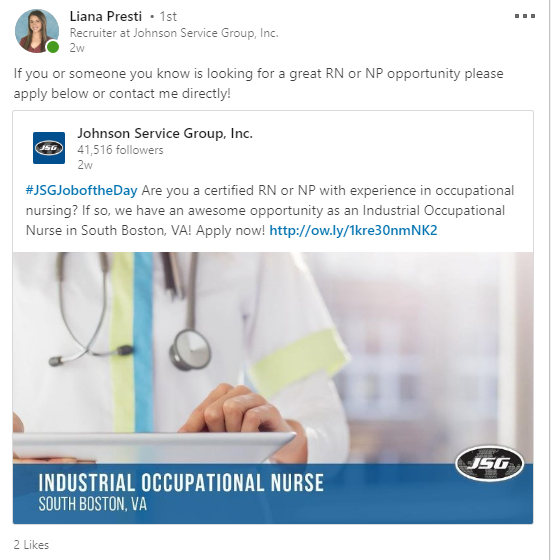 When it comes to selling to a company or recruiting for job orders, LinkedIn is a tool that can exponentially expand your reach to prospective clients and candidates. 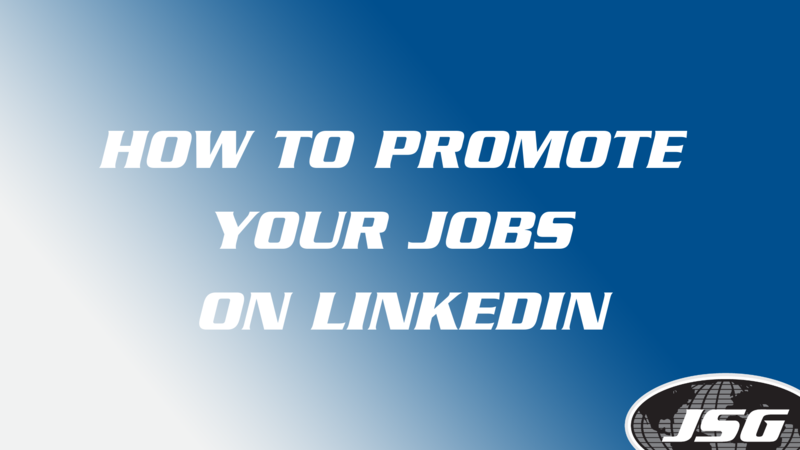 When promoting and posting your specific jobs on LinkedIn, here are some best practices to help expand your reach. 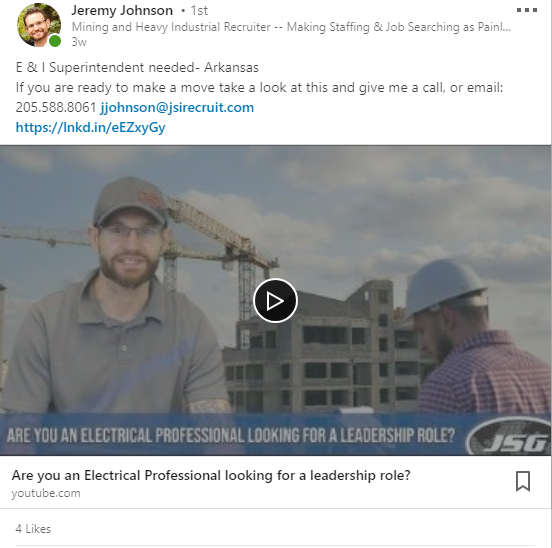 When you include a picture or video in your job posting, it adds something that catches people’s eyes and keeps them interested. On LinkedIn, it helps your ability to reach more people. When you add a picture on any post, your post is 12x more likely to be seen. And if you add a video, 5x more people will interact with it over any other LinkedIn post. This is essential when sharing a job because whenever someone likes, comments, and shares your post, it also is shared with their networks. Which then becomes this domino effect of how many people could possibly see your post. The next thing you want to do is provide a short and concise description of the job in your post. You want to add the job title, location, and maybe one or two things they need to have to be a qualified candidate. You also want to make sure to put in your contact information, as well as the link to your specific job posting. This way they can contact you if they have questions or can head straight to the link to apply. Below are a few examples of great job postings on LinkedIn! If you need help with finding a picture, would like a job skin, want to have us make you a video, need some ideas on what to say, we are always here to help! Our job is to make your lives easier and help you find great candidates and clients. So please don’t hesitate to reach out to us if you need anything. Also, if you’re wanting to use pictures for your jobs, make sure to use royalty free ones. Below are approved sites you can take pictures from and not have to worry about stealing someone else’s work! And the last thing to do is share your post. Once shared on your page, it will start to gain traction. Remember, we’re a team. The more we support our co-workers’ jobs as well as our own, the more people learn and know about Johnson Service Group. And before you know it, people will start to reach out to you, both clients and candidates, to see if they have an opportunity to partner with you. We hope this helped you when it comes to how and what you should post when you’re posting a job on LinkedIn. It doesn’t need to be difficult. And with these tips, we hope they make marketing and candidates about your jobs more exciting and fun. LinkedIn is a great platform and if used to its potential, it could really help you find the people you are wanting to find. Bullhorn is a fantastic tool that helps keep us organized and on task. It gives us the opportunity to check on our clients, candidates, tear sheets, task lists, and so much more. But you already knew that. However, did you know that you can create shortcuts in the Bullhorn “bowling alley” (the left-hand start-up menu) to quickly access all of this data? 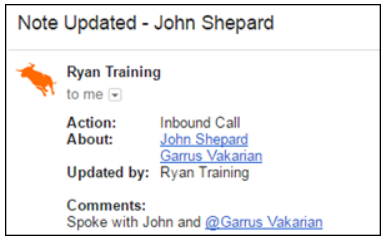 This little trick will save you a lot of time and make using Bullhorn even easier. Here’s how to customize your bowling alley to streamline your day. First of all, after you log into Bullhorn, and press Menu. Once you have the Menu pulled up, press preferences at the bottom of your screen. Once you are in the preferences, scroll down to “Start-up Screens.” This is where you will type in the different shortcuts you want in your bowling alley. Type the fields slowly and when they auto-populate, click them. In this example, I have added Contact list and Submission List to be added to my bowling alley. Once you’ve added all the fields you would like in your bowling alley, press “save” at the bottom of the screen. Once your start-up screen additions have been saved, log out of Bullhorn and log back in. Once you log back in, these new start-up screen fields will be in your Bullhorn bowling alley, as you can see below. Once you have you start-up fields customize in the bowling alley, you can add filters and customize the fields to your liking. When you close Bullhorn, your progress is always saved, so you shouldn’ have to customize these fields again! And just like that, your Bullhorn is customized to save your valuable time throughout the day. Oh No, My Candidate Has Hits on Their Background Check. What Do I Do? First, the background check can only go back seven years; anything outside of seven years should not be on the report or considered when making an employment decision. 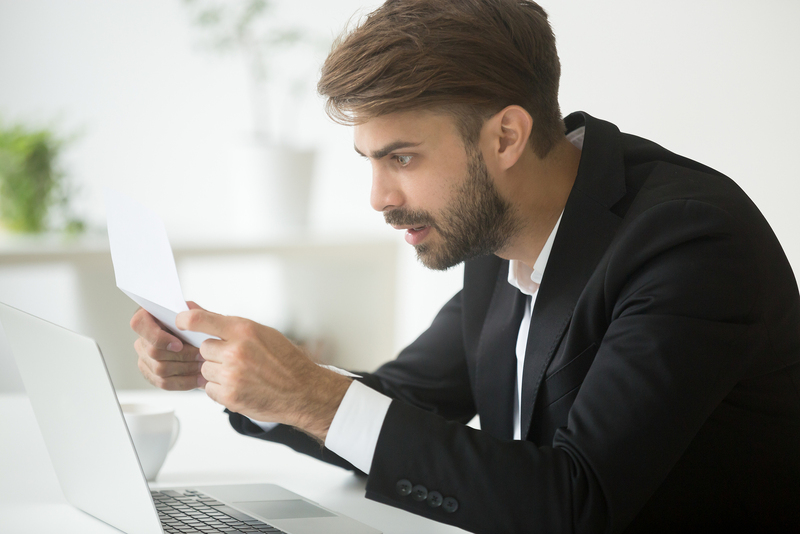 When a candidate’s background check comes back with negative results, you should first check with the client to see if they will accept someone with the specific convictions. If the client does not want to employ the person based on the results, the background report and authorization should be sent to HR immediately. 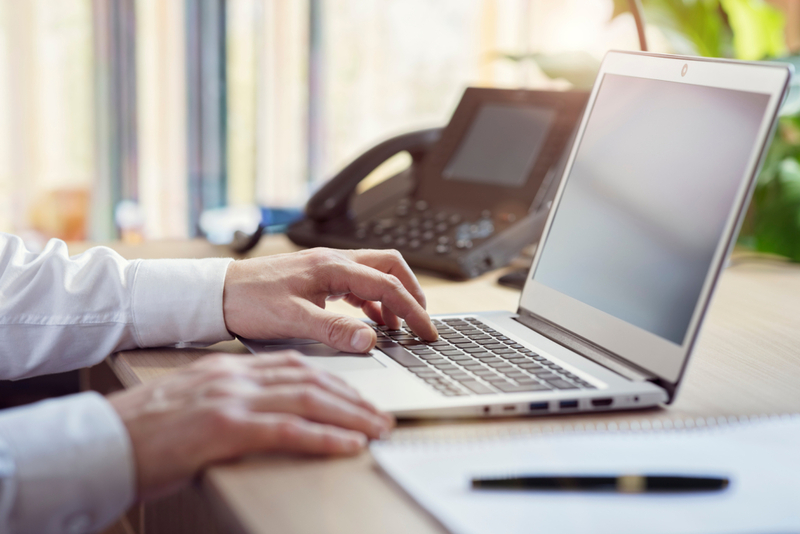 After HR is receives the background check and authorization, the candidate should be informed that their start date is on hold because HR has further questions about the background report and will be sending an email. HR will then send the candidate a pre-adverse action letter. This letter informs the employee that there have been negative findings and gives them five (ten in California) business days to contact HR and/or the background company to dispute the convictions. The recruiters/salespeople involved with the case are BCC’d on the email so they are aware of where the HR is in the process. What if They’re Already Working? If the contractor is already working (pending the results of the background report) they should be pulled from the client until the background issues are resolved or until they’re permanently let go. It’s very important that the contractor understands that they are not terminated during this process but they are not scheduled to work. We do not terminate them until the adverse action is sent out. Once HR sends the pre-adverse action letter, the candidate should only have contact with HR. If the person reaches out to anyone in the branch office, please direct them to Linnea. If the candidate does not resolve the conviction within the allotted business days, they are officially not able to start with JSG. At this time, HR will send an adverse action letter to the employee informing them that we will not be moving forward with employment. This policy is in compliance with the procedures listed in the Fair Credit Reporting Act (FCRA). If you have any further questions about the adverse action process, please contact HR. https://jsginc.com/wp-content/uploads/2019/02/bigstock-Amazed-Businessman-In-Suit-Fee-225808939.jpg 1067 1600 Matthew Bennett https://jsginc.com/wp-content/uploads/2016/06/JSG_Logo_Tagline_Sept_2015M.png Matthew Bennett2019-02-05 11:58:442019-02-08 14:35:09Oh No, My Candidate Has Hits on Their Background Check. What Do I Do? 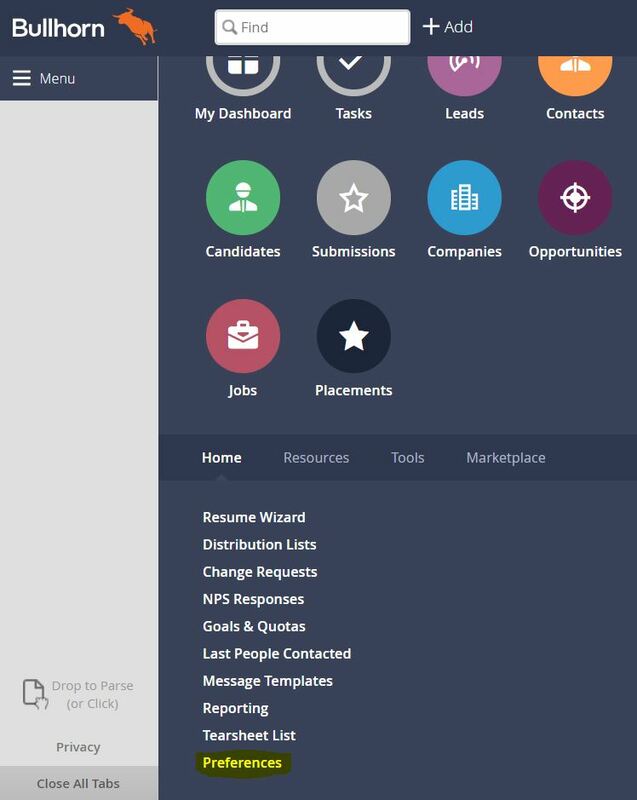 Adding notes in Bullhorn is an essential way to retain and know details about all of the interactions you have with candidates and clients. It’s a way to stay organized, trace your steps, and know when and where conversations happened. As we enter 2019, it’s imperative we all pay more attention to the tools we have that will help us be successful. Notes are an important part of this conscious change, and here’s how we can implement them better! Using this tool will help you stay organized and feel more prepared throughout the recruiting process. Tagging is a great way to link back to other records you have within Bullhorn. Whether it’s a name, phone number, ID all you have to do is write out the following in the note: @[record name] or @[record phone number] or @[record ID]. When you tag a record, it will automatically be added as an Additional Reference. This then is turned into a hyperlink that will open into a new Bullhorn tab when clicked. It happens to the best of us! We accidentally close out of our tab or all of a sudden, our internet browser crashes. Well, good news! Bullhorn automatically saves notes you started in draft mode. So, if you were working on it, just head to your drafts and you should be able to locate it. But be careful. Bullhorn will only keep your note drafts if you create them in the note tab NOT the preview slideout. Hopefully, this month’s Bullhorn tips have been helpful and we look forward to seeing these tips in action this new year! Congratulations to all of our team members with anniversaries in January! Please join us in celebrating our tenured staff for their dedication and service to JSG. We love having you on the team. We gained some fresh faces in December here at JSG, and we’d love for you to join us in welcoming them to the family!